There is so much to talk about with Elysium. I will share, for instance, that I’ve never disliked a book I’ve committed to listening to on audio. Because spending a dozen-plus hours with a story and narrator is not something I take on lightly, and when I do, I’m all in. 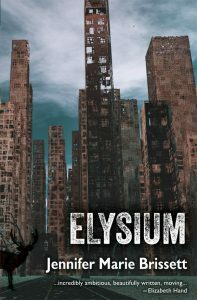 I knew absolutely nothing about Elysium going in, and it was so many parts emotional rollercoaster, ambitious post-apocalyptic world-building and, ultimately, a saga of love and loss. Elysium begins with the banal scene of our main character, Adrianne, contemplating meeting a friend for lunch. Nothing is out of the ordinary, save for strange green dot. She gets injured by some falling scaffolding and goes home to her boyfriend, Antoine. Then, the narrative rug is pulled out from underneath. After a series of 1s and 0s and a system reboot, Adrianne is now Adrian, a man with an ailing boyfriend, also called Antoine, and it’s no longer summer, but fall. Every few pages is a new scene, a new circumstance, bled from the corner of the last to the next, with motifs of deer and owls in the margins. Each new story grows progressively bleaker, with the same iteration of character names: Adrian, Adrianne, Antoine, Antoinette, Hector, Helen, the one who doesn’t talk too much, the two that were more than friends, and so on. Brissett keeps almost nothing else consistent–are the main characters female or male? What is their sexual identity or orientation? Are they lovers? Parent and child? Best friends? Siblings? Are they wealthy, or poor? Struggling to survive, or do they have privileges of birth?–except that in all of them, one character was loved, and subsequently lost. And what a fearless, ambitious story Brissett tells. Upon listening, it was as if she starts off in one square of a chessboard, only to lift the reader slowly to see the whole game. There were a lot of WTF moments, but in the best possible way, like “WTF is happening, because wow she went there.” The constant shifting identities and circumstances in Elysium is integral to the story, and transitions are marked by code, diagnostic failures, system reboots, and 0’s and 1’s (try listening to this on audio!). Without giving away too much, there’s a super clever and excellent reason for this, and you’re reading a book that starts off as contemporary, I will tell you that it’s squarely and unabashedly science fiction. Besides the fascinating structure of the book, the underlying theme for me is how love and loss tie into the human condition: because ELYSIUM is about lovers and soulmates and friendship and family, as well as survival and heartbreak and illness and grief, is the story of… people. The people we love, and how we mourn them when they’re gone. Because who are we if we don’t love?